Sciblogs | Can pandemic threats justify border closure for island nations like NZ? Can pandemic threats justify border closure for island nations like NZ? Countries prepare for future pandemic risks because of pandemic influenza, novel emerging infectious agents and possible synthetic bioweapons. In a study we just published in a journal, we explored the costs and benefits of complete border closure in NZ in response to new pandemic threats. We found that there were some very severe pandemic scenarios where rapid closure of NZ’s border could provide overall societal benefit – even with the disruptions it would cause to tourism and trade. Humanity probably faces increasing risks of new pandemics because of the growing density of human populations and various socio-economic, environmental and ecological factors (1). There are also added threats from deliberate human modification of existing or potential pathogens (2). 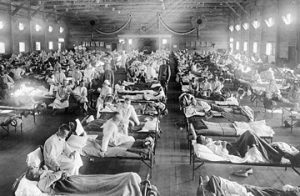 Many millions of people were affected by the outbreak of Spanish Flu during World War One. A common view is that country border closures have a limited, if any, role in preventing the spread of pandemics (3). Indeed, World Health Organization (WHO) advice is that while there might be benefits from border closure (in terms of delays to disease introduction), that it is unlikely to be able to prevent importation, and can have huge economic and personal costs. Eg, the potential economic damage from a border closure in one US study was of a halving of GDP (4). But we wondered if this WHO advice might not apply to small island nations in some circumstances. We know that historically there is evidence that border closure can be effective in preventing the spread of pandemic influenza: in various Pacific islands (5) and for US military bases (6). Also it seems biologically plausible that a new infectious agent (eg, a synthetic bioweapon or an existing agent like Ebola that evolved to become more infectious), could be of such severity that attempting border closure could become a rational choice for island nations like NZ. That is especially if that closure decision could be made in time (an issue that we admit is a challenge in an era of fast jet travel – though diseases like SARS were stopped before they ever reached NZ). Alternatives such as screening arriving travellers at the border have very limited effectiveness, at least for respiratory agents like pandemic influenza (7). It is very geographically remote (so that alternatives to aircraft travel to reach the country are limited). It has a very well developed border control system (primarily to prevent biological agents that could threaten NZ agriculture). It is relatively well organised when it comes to disease control: it has successfully eradicated brucellosis, hydatids and more recently an invasive mosquito species that had spread to multiple parts of the country (8). The speed at which NZ ended polio epidemics once a vaccine became available was particularly spectacular (8). On the other hand, NZ is also a nation that is highly dependent on tourism revenues and on exports. The leaders at the time of a pandemic might also be too hesitant to make the rapid decisions necessary to close the borders to incoming aircraft. It is also likely that closure could not be activated in time, unless the procedures to do so rapidly had already been designed. Our study involved an Excel spreadsheet model that was used to conduct a cost-benefit analysis from a societal perspective. Case-study specific epidemiological data were sourced from past influenza pandemics. Country-specific healthcare cost data, valuation of life, and lost tourism revenue were imputed (with lost trade also in scenario analyses). Full details are available in the (open access) online journal article. The results suggested large net gains from border closure in some extreme pandemic scenarios. That is, for a new pandemic equivalent to the 1918 influenza pandemic (albeit with half the mortality rate, “Scenario A”), it was estimated that successful border closure for 26 weeks provided a net societal benefit (eg, of NZ$11.0 billion). This benefit was despite the end to tourism revenues. We also estimated various threshold effects, eg, a net societal benefit was estimated for closing the borders for up to 50 weeks if 0.15% of the population were predicted to die in a pandemic and if border closure was successful. For border closures to prevent these pandemic scenarios, the cost-benefit analysis results were largely driven by the valuation of potential premature deaths averted (the lost life-years component of the quality-adjusted life-years [QALYs] calculated). Nevertheless, when we removed the monetisation of these lost QALYs from the calculations, a 12-week border closure was still cost-beneficial in some scenarios. Even in the face of a complete end to trade (both exports and imports in scenario analysis), a net benefit was estimated for scenarios where the mortality rate was very high (eg, in “Scenario B” at 10 times the mortality impact of “Scenario A”, or 2.75% of the country’s population dying). In this situation, the net benefit was NZ$54 billion. But for a pandemic with five times the adverse mortality impact of “Scenario A”, there was a period of closure between 12 and 26 weeks at which the net benefit switched from favourable to unfavourable. A strength of this study is that it appears to be the first to attempt to weigh the economic and health issues associated with pandemic-related border closure at an island country level. Even so there are many limitations of this work (see the full article). A particular issue is that we can’t be absolutely sure that our assumption in the base-case analysis about on-going trade during “border closure” was valid. That is we assumed that trade in exports and imports would continue with appropriate controls to ensure complete isolation of incoming air cargo crews and ship crews in special port facilities or with ship crews never leaving their vessels. (Indeed, the latter is already sometimes the case when ships load/off-load at NZ ports. Additionally, there is now very active international development of unmanned cargo ships controlled from land in an effort to reduce costs and improve safety). Nevertheless, in scenario analyses we did consider the complete end of trade. That NZ’s pandemic plans have the capacity to deal with extreme scenarios (eg, pandemics from synthetic pathogens) where a period of border closure might be the optimal response. In particular, such plans should include how the military, police and customs enforce border controls (eg, while allowing cargo planes and ships to keep coming to NZ). That all such plans are endorsed by the major political parties in the country to minimise the risk of delays attributable to political posturing. That all the necessary legal mechanisms are in place to allow the Prime Minister to close NZ’s borders to air travel within a matter of hours and in the potential context of high uncertainty. And similarly to instantly require steps for intensive protective sequestration around port facilities. That simulation exercises are conducted around all key aspects of border closure. That NZ works with WHO to develop pandemic planning guidance that is specific for island nations (especially small island nations which have unique opportunities for controlling their borders in pandemics (9)). This “proof-of-concept” modelling work suggests that in some extreme pandemic scenarios it may make sense for NZ to close its borders. More detailed cost-benefit analysis of border closure is probably warranted to refine the circumstances where this intervention would be appropriate. It would also be prudent to refine the country’s existing pandemic planning to ensure it can support rapid border closure if this intervention becomes necessary. Jones K, Patel N, Levy M, Storevgard A, Balk D, Gittleman J. Global trends in emerging infectious diseases. Nature. 2008;451:990-993. Casadevall A, Imperiale M. Risks and benefits of gain-of-function experiments with pathogens of pandemic potential, such as influenza virus: a call for a science-based discussion. MBio. 2014;5(4):e01730-01714. Bell D, World Health Organization Working Group on International and Community Transmission of SARS. Public health interventions and SARS spread, 2003. Emerging Infectious Diseases. 2004;10(11):1900-1906. Dixon P, Giesecke J, Rimmer M, Rose A. The Economic Consequences of U.S. Border Closure in Response to a Security Threat: A Dynamic CGE Assessment. Defence and Peace Economics. 2010;22(1):85-97. Markel H, Stern AM, Navarro JA, Michalsen JR, Monto AS, DiGiovanni C. Nonpharmaceutical influenza mitigation strategies, US communities, 1918-1920 pandemic. Emerg Infect Dis. 2006;12(12):1961-1964. Hale MJ, Hoskins RS, Baker MG. Screening for Influenza A(H1N1)pdm09, Auckland International Airport, New Zealand. Emerg Infect Dis. 2012;18:866-868. Wilson N, Baker MG. Celebrating 50 years of polio elimination in New Zealand: but inadequate progress in eliminating other vaccine-preventable diseases. N Z Med J. 2012;125(1365):67-74. Very interesting study. One thing to consider for refining the model is that you have assumed that all the businesses that lose revenue will be able to just wear the losses. To my mind that is quite a long time that businesses e.g airlines, hotels etc aren’t getting income. It may cause lots to fold – surely that cost may be substantial & needs to be considered. Yes this is a good point and it would certainly add to the economic downsides if some NZ tourism-related businesses had to fold during a multi-month period of border closure. Of course to some extent all tourism globally would probably suffer during a serious pandemic – so there would be problems regardless of border closure by NZ. Even with border closure, tourism businesses in some areas might keep going with domestic tourism and some might have insurance cover. Nevertheless, there might be scope for advanced pandemic planning to include the option of fiscal support from government to tourism-related businesses (eg, emergency grants or low-interest loans). As we state in our article there is a lot more detail that could be added into such modelling work – and this is probably best done by government agencies such as the Treasury and the Ministry of Health.